Mastery of the student of LTSNU arouses admiration. 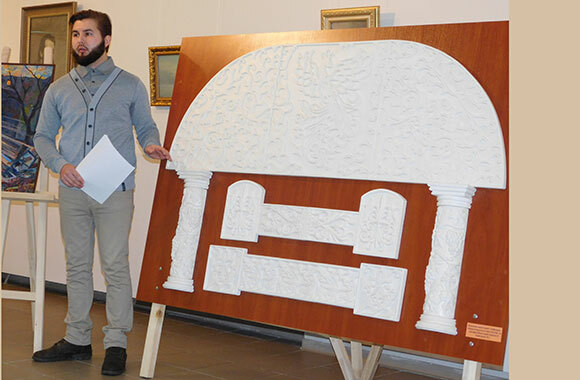 During the defense of creative works and master’s theses in the specialties “Fine Arts” and “Decorative and Applied Arts” a special interest and admiration of the audience and members of the Commission caused a creative work of Roman Savchenko – interior design. 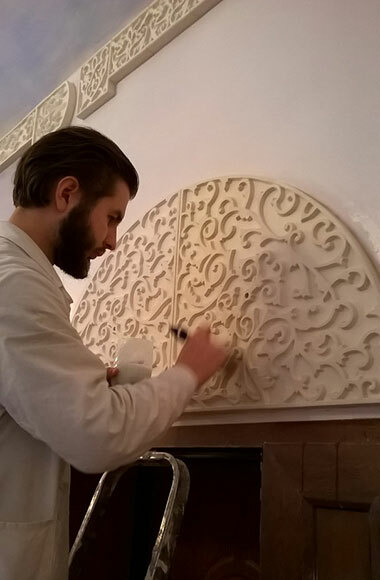 His fragments of plaster ornament decor is the result of a great practice. 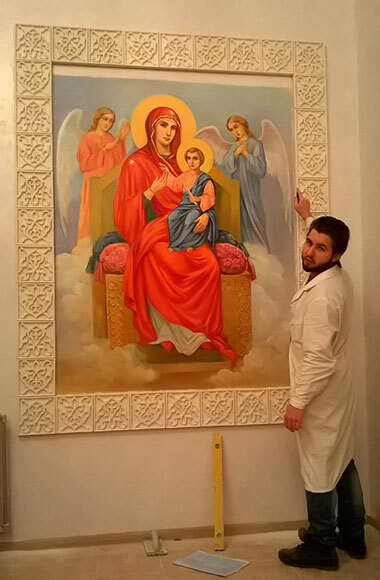 Roman Savchenko, a citizen of Luhansk, son of a clergyman, was invited to work on the design of the refectory of St. Cyril’s Monastery in Kyiv. Roman Savchenko made floral ornaments, which frame icons and delimit walls and ceiling. Also he made columns with vines, which are located along the door of the refectory, the arch over the door depicting birds. 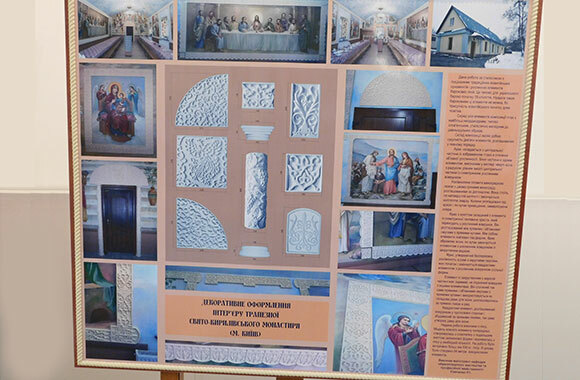 Now all these works decorate the refectory of the monastery in Kyiv. It took over three months for Roman to create models from plasticine, silicone molds, casting from plaster and mount the ornamented decor. 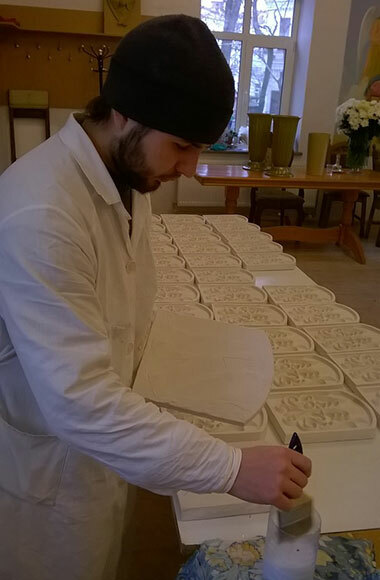 The author took more than 500 kilograms of gypsum to create a plaster decoration. The total length of the work – 54 meters. 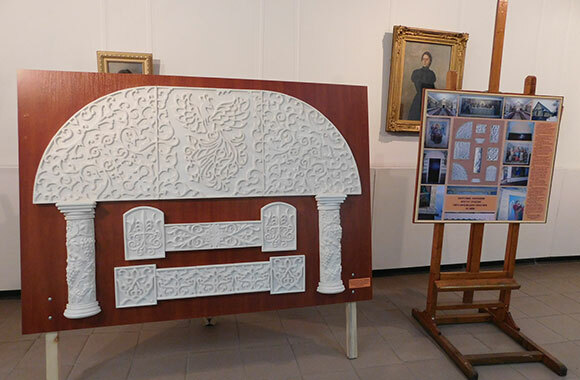 The creative work of R. Savchenko is closely intertwined with the Master’s thesis, the topic is “Methods of Interior Decoration of the Objects of Orthodox Architecture by Means of Decorative Plastic”, where the author highlighted fundamentally theoretical problems of decorating places of worship. We are proud of the talent, the high level of skills of our graduate, whose work has now become the cultural heritage of our country.